“Our mom taught us to play the piano and violin when we were 4-yrs-old. Our passion for singing started when we were given a karaoke machine in elementary school. Every day we would come home from school and sing until our voices were sore. Missy got a guitar in eighth grade, and Chelsea received her bass guitar in 6th grade, and we’ve been playing together ever since! Well, here’s another couple names to write down somewhere for future reference – Missy and Chelsea Zenker. If these two don’t end up being at least moderately famous, there is no justice in this world. Imagine a non-annoying Taylor Swift (don’t get me wrong, I respect the hell out of her for how she handles herself – personally and professionally – but damn, she’s annoying) with a bit of Jewel and the pre-sellout-clown-on-acid Katy Perry mixed in. Everything after that is pure originality and unimaginable talent. Reminding me at times of First Aid Kit, Missy and Chelsea Zenker’s music has just a wee-bit of Country Twang to it, a little Folk, a smidgen of Rock and a healthy dose of Pop. To be quite honest, I’m pretty intrigued to see how the music from these ladies evolves over the coming years and what other instruments they incorporate into their songs. Will they settle into a sound that’s more Countryish like Tonight’s Red and Green or will they go with a Pop-Rock sound like Can’t Concentrate? Stay tuned. The song that I found to be the catchiest little diddy that will, in my opinion, almost certainly become their trademark song was No Stopping Us Now. It had a nice, quick beat and the vocals from Missy were brilliantly crisp and clear. She has pretty amazing vocal range and clearly has oodles of raw talent. The other song I was pretty fond of was Can I Have This Dance. Very impressive. As I listened to each song I found myself wondering what some of these songs might sound like if there were some vocal harmony and perhaps some drums – specifically Can I Have This Dance and Same Story. Don’t get me wrong, they are fantastic, but don’t think for a minute that’s as good as it gets. Throw in some drums, some backing vocals/harmony and you’ve got yourself a chart-topper… easily. On one hand I loved the simplicity and rawness of those songs, but on the other hand it got me itching for more. Maybe I’m just greedy like that. And it would be a crime to overlook the lyrics. They are insightful, clever, witty, crafty, and heartfelt. Poetic genius, reminiscent of Charlotte Eriksson. Passion and honesty being put on display for the ears to judge is about as scary as it gets, but these two have nothing to be afraid of. As if being amazing at just the music part of it all wasn’t enough, the expertise showcased in their songs only validates my claim that Missy and Chelsea are headed for stardom. Like I said at the start, you will be hearing a lot about these two ladies in the years to come. How do I know? Because they are this good this early. Oh ya, did I forget to mention they are only 17 and 15? Ya. File them under “prodigy” along with Orla Gartland. It’s crazy how some people end up being so talented. And in case you had the misguided thought that these two ladies were the product of Auto-tune or fancy recording tricks, check out their video above of a live performance. Give them some thumb-ups… thumbs-up… Like them on Facebook. They’re legit. They’re amazing. They are Missy and Chelsea Zenker. Enjoy! There’s no doubt my niece’s are extremely talented. They are also wonderful young ladies as well. So proud of these girls! Absolutely – Their future is as bright as can be! Something tells me the pride-factor of your family will be skyrocketing. Thanks for checking out MarsBands! Missy and Chelsea got it going on! Their music brings joy to the world and I look forward to years of them entertaining us. I agree with all you shared. Thank you!!! Well their music certainly brought joy to my ears! I took look forward to hearing what they come up with next. I love being continuously amazed at people’s creativity! Thanks for commenting! wow!! 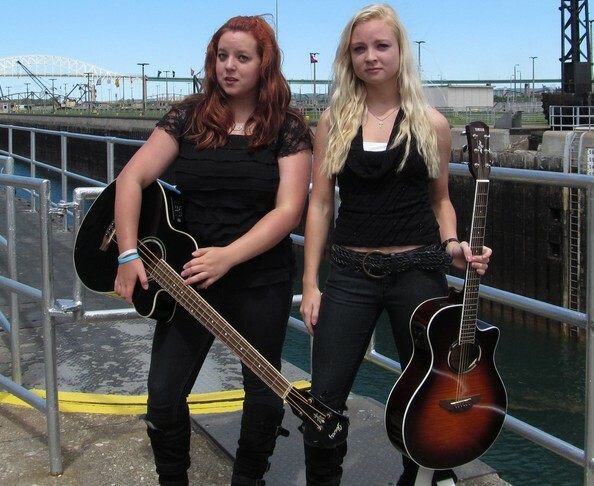 Rozann told us they were talented, but they are truly stars in the making. Sent it out on my facebook and I just know that more people are going to be listening and loving their music as much as we do……what thoughtful lyrics and inspiring, uplifting music! These ladies are prodigies in every sense of the word. Most of the more “established” musicians would pay big money for the skills and talents Missy and Chelsea possess! Thanks for commenting! Nice review. I’ve heard these young ladies play live. Your observations are spot on. Well thank you! I try to be as observant and honest as possible in my reviews. It would be an honor to get to see them perform live. I hope one day I am that lucky! Thanks for commenting! I love listening to Missy and Chelsea. Their pitches are so accurate and the songs are youthful and pleasing. I’m sure that your encouraging review must mean a lot to them! The part that floors me every time is that they are so young! I can’t even imagine how good they are going to be once they’ve acquired more years of experience! Thanks for commenting!